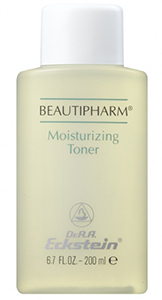 A refreshing and vitalizing toner for all skin types. Moisturizes, soothes, and normalizes with Allantoin, Bisabolol, and natural moisturizing components. Removes excess dirt, oil, and dead skin cells and is pH balanced for the most effective care. Instructions: After cleansing, while skin is still damp, apply with a cotton pad to face and neck area. May be used twice daily.